Massive Audio has designed the NEW DBX4, the most powerful, full range digital, four channel, production 12 Volt mobile audio amplifier ever built. At over 2 Kilowatts of Max output power this CES 2006 Certified 230W RMS x 4 @ 4 Ohm (250W RMS x 4 @ 2 Ohm) all digital full range amp has state of the art controls! Just in @ 1.9” H x 5.9” W x 9.4” L it may be dismissed as a toy at first glance but look close at the controls. 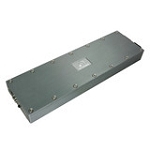 The LP crossover is adjustable from 50Hz – 6K with the use of the X11 switch. The HP is adjustable from 20Hz - 45 KHz or 360Hz 6 KHz. 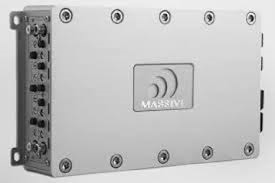 This allows HP/LP/Band pass configurations that allow the use of raw drives without passive power robbing crossovers. The DBX4 has a 1 band parametric equalizer, -6Db~+ 12Db @ 30Hz – 120Hz and with built in OEM integration the supplied RCA “bullet” adaptors allow the installer to go directly into the RCA inputs which activates the ATO feature. Look close and you’ll see a “docking port” on the end cap. 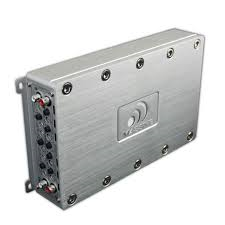 This allows the optional DBX 4 Farad CAP to connect directly to the power supply for improved dynamics and power balance. Massive Audio has Raised the Bar Once Again with the 2014 Digital Quad Powered DBX4!